Are the rules and regulations surrounding weddings driving you crazy? Let us sooth your mind and give you a stress-free rundown. This is a quick drive through the etiquette minefield. This is one of the biggest headaches for any happy couple. Who pays for what and how to work out the budget? The Mother of the Bride plays a pivotal role in the run up to the wedding and during it. She is expected to help the Bride with her wedding attire and assist in anyway in the preparations. The Mother of the Bride is traditionally the one who invites the guests to the wedding. She is also the one who is responsible for those out-of-town guests on her side of the family. This means making hotel reservations when necessary and ensuring that there are taxis or transportation available for such guests. The mother of the Groom is, in contrast, a much smaller role. Her main function, when hearing of the engagement, is to contact the Bride’s family and let them know how happy she and her family are to hear of the forthcoming union.The Mother of the Groom can also be responsible for her out-of-town guests on her family’s side. Liaising with the mother of the Bride as to accommodation is therefore required. Making the first toast to the happy couple. The Bride and the Groom should always be the first to take the floor at the wedding reception. The song playing should be one especially chosen by the happy couple, with dimmed lights to create a romantic atmosphere. It is traditional for the father of the Bride to get the next dance with his daughter and as such the Groom should ask the Bride’s mother to join him. The Groom’s parents are the next on the list, with the Best Man then dancing with the Bride. The entire Bridal party is invited onto the dance floor soon after the Bride and Groom have had their first dance. The order and type of dance performed will vary according to the culture and religion of the Bride and the Groom. This can create a headache. Who do you tip and how much do you tip them? Look at your contracts first. If you have hired a private venue with serving staff, gratuities will almost always have calculated into the final price, making it unnecessary to add to the total with extra tips. However, there are still florists, photographers and cake-makers to think about. Each of these should receive up to 15% - provided that you were happy with their work of course. The driver who transports you from the church or registry office to the wedding reception venue should also receive a tip. Another 15% should be budgeted for although it may be that a service charge has been already calculated so pull out those contracts and get the facts. Priests and clergymen won’t expect a personal tip. By all means invite them to join the celebrations at the wedding reception and do contribute to the church funds – anything up to £100 would be appropriate. A personal thank you card must be sent to your guests after the wedding celebrations. It really is the only way to say thank you. An email or a text message will not suffice – a card sent by post most definitely will. Be warned! This might be a mammoth task. You should thank not only the guests but also anyone who may have sent you a gift, as well as anyone who attended the hen party or stag party but was unable to come on the day. An absolute no-no is to send a pre-printed thank you card. This is both impersonal and lazy. If someone gave you a fantastic wedding present they will like to receive a personalised comment about how thankful you are. 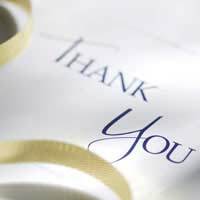 Comments needn’t be long or detailed – a sentence or two stating your appreciation of the gift and how you will enjoy using or admiring it is enough.Each gift warrants an individual thank you card. If one of your friends or relatives gave you two separate presents you should honour this with two separate thank you cards. This is just a quick etiquette guide and you can dig deeper into the rulebook. However, it is not necessary to do so. Enjoy your day and try not to fret about etiquette. Just be thoughtful of others, talk to as many of your guests as you can and you will be guaranteed an etiquette perfect day to remember!